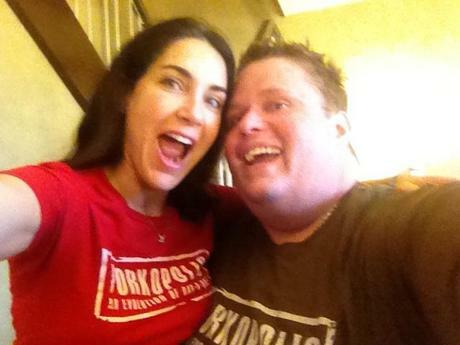 The author and her husband sporting t-shirts from Porkopolis, their latest investment. I grew up in a Reform household. I had a “Jew Lite” upbringing, so keeping kosher was a concept that I never quite grasped. When I was a kid, my family moved from a Jewish part of Toronto to Texas, home of that famous porkBBQ. Moving from Canada to Texas was a huge culture shock. In Toronto we were living in an area where being Jewish was accepted and not even thought about. If you were gentile, you were the anomaly in the neighborhood. In Texas, I was one of very few Jews. Animal heads hung in every restaurant. It freaked me out. I couldn’t deal with it as a kid. It made me cry. I became a vegetarian when I first moved there. But I eventually acclimated. I was in the pork heartland, after all, where I was surrounded by people who saw no problem with eating pigs. In time, I didn’t really either. For fourteen years I’ve been romantically involved with a Southern gentile. Pork is a religion in and of itself for my husband. If it were socially acceptable, he would drape himself in pork the way Lady Gaga wore a meat suit. We have never had any conflicts when it comes to his pork eating. I love him, he loves pork and basking in its meaty glory, and that’s OK. I’ll eat it, but I won’t be thrilled about it. It’s just not really for me, especially given all of the recent news reports about the poor treatment of animals and the health issues surrounding meat consumption. I do still eat pork and other meats on rare occasions. My husband and I live part of the time in Nashville where we go out to restaurants that serve pork in nearly every dish. There’s pork inside potatoes, there’s bacon and there are eggs with bacon. Going to those restaurants is something I do about once a year because it feels greasy and gross to eat like that.